This Easy Chocolate Fudge recipe is made with just 3 ingredients, including sweetened condensed milk, and has such a rich chocolate flavor! It’s a simple treat to put together for gifts and sharing this holiday season. I’ve been loving testing out new fudge recipes lately. Did you catch my Easy White Chocolate Cranberry Fudge recently? SO good! Both that fudge and this one are so rich and creamy, it’s hard to stop eating them! Now, there are two great things I’ve found about fudge lately. One – it can be incredibly easy to make. And two – it’s a delicious treat to snack on when taking care of twins. 😉 The only problem with that is it might be too easy. 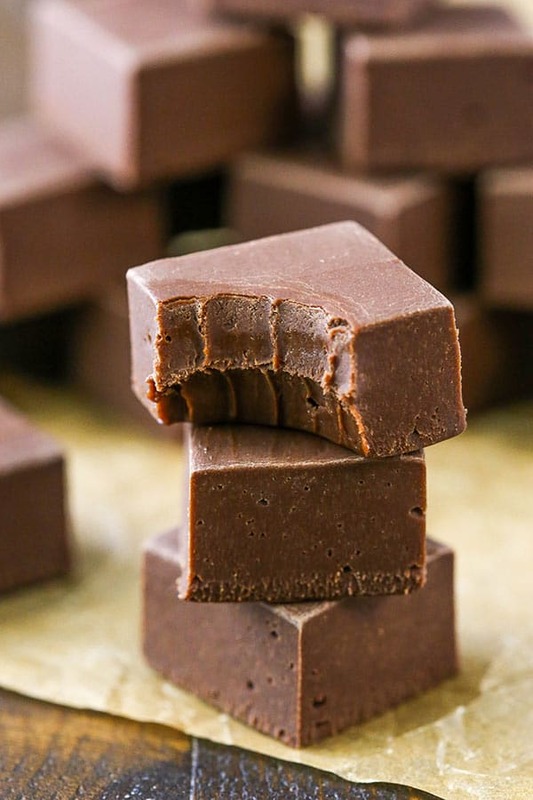 So to get started making this easy chocolate fudge, you’ll need just three ingredients – chocolate chips, sweetened condensed milk and vanilla extract. Hopefully you’re like me and already have those 3 things in your pantry at all times. Grab a 9×9 inch pan and line it with parchment paper and set that aside. Then put the chocolate chips and sweetened condensed milk into a large microwave safe bowl. Microwave them for one minute, then stir to combine and let the residual heat do as much of the melting as it can. If it needs another 30 seconds or so, go ahead and heat it some more, then stir it until it’s melted. Once everything is melted together, add the vanilla extract and combine everything. Working quickly, pour the mixture into the prepared pan and spread it out evenly. Let the fudge cool to room temperature before cutting into squares. You could also let it cool in the fridge to speed up the process, but it doesn’t have to be refrigerated. 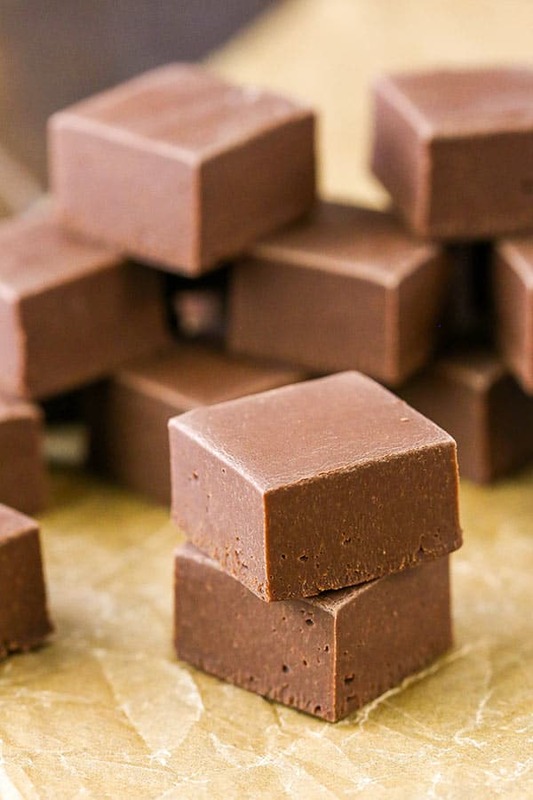 This chocolate fudge is so easy to make, it takes all of about three minutes! 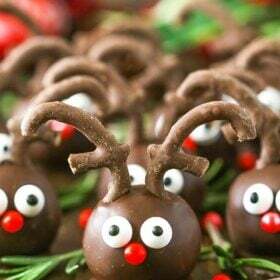 A minute to prepare the pan and ingredients, a minute to melt the chocolate and a minute to spread it out into the pan. Seriously – SO EASY! You will be enjoying the best chocolate fudge before you know it! Dense, rich, chocolatey, delicious! What are you waiting for?! This easy chocolate fudge recipe is made with just 3 ingredients and is full of rich chocolate flavor! A simple Christmas or holiday gift you’ll love. 1. Line a 9×9 square pan with parchment paper that covers the sides of the pan. 2. Place the chocolate chips and sweetened condensed milk in a large bowl and microwave for one minute. Stir well to combine and allow the heat to melt the chocolate chips. If needed, microwave for another 30 seconds or so, until the chocolate is completely smooth. 3. Stir in the vanilla extract, then quickly transfer the mixture to the lined pan and spread evenly. 4. Let the fudge cool completely to room temperature before cutting into squares. You could also refrigerate it until it’s cool. 5. Cut the fudge and store in an air tight container. 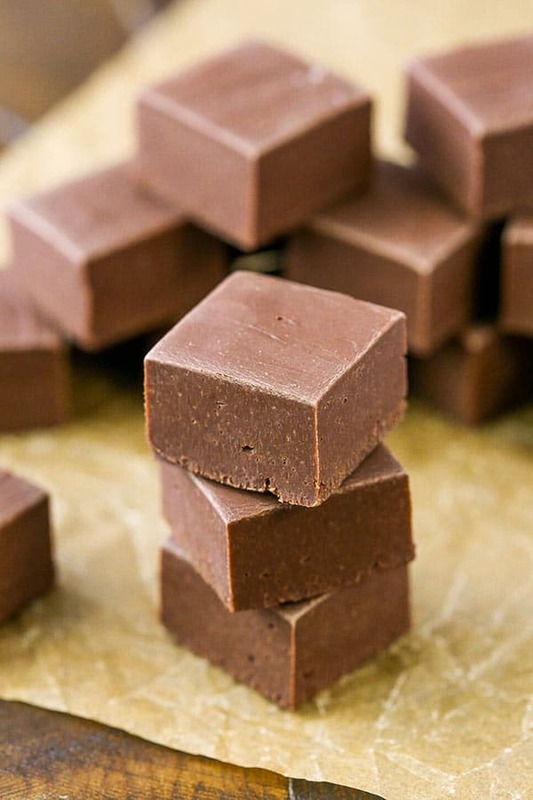 Fudge can be stored at either room temperature or the fridge. This recipe is easy-peasy and yummy. I have a question though, how do I print out your recipes? I always have to write them down in order to keep them for later as there isn’t a ‘print’ option included (that I can see). The print option is fixed for this recipe now! There’s a red button labeled “print” in the pink recipe card. Just hit that button and it brings up the printable version of the recipe. What I want to know is…how do you cut it to make it look so pretty!? I have been making my fudge this way for the past 30 years. I make this recipe for my mother and she thinks I have gone to a lot of trouble. 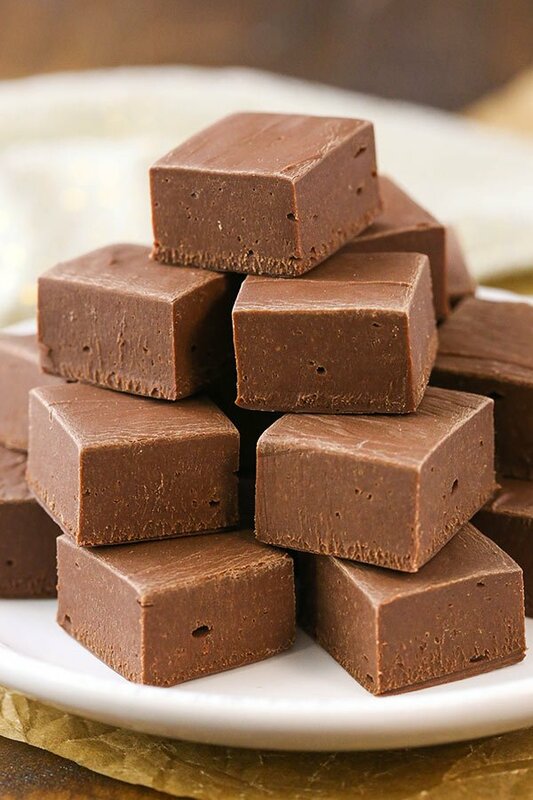 I love how easy this fudge is to make! Can I use extra dark chocolate chips (63% cacao)? I have actually been wanting to make fudge for people this holiday. 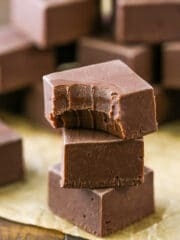 This fudge looks so nice and easy to make, that it’s probably the fudge I will be making soon. 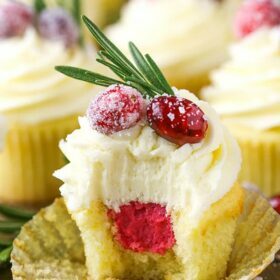 Thanks for sharing this delicious looking recipe! 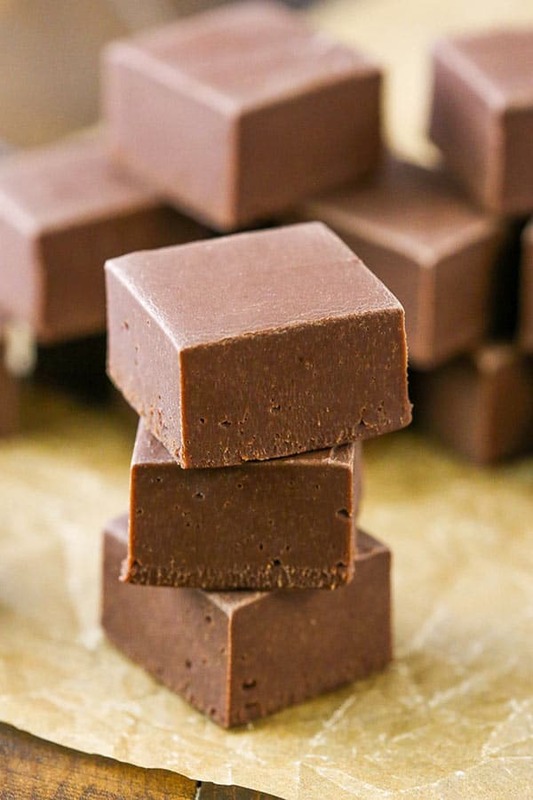 Also, I am seriously in love with fudge, and this recipe will probably be my go to! Wow! That looks nicer than fudge you’d pay $10.00 per pound for at an upscale candy shop! Just wondering if this would freeze well, Lindsay? If not, how long do you think it would keep in an air tight container (room temperature or fridge)? Thank you! It should be fine for a week or two at room temperature and maybe another week in the fridge. I haven’t tried freezing it, but I think it’d be fine. I made the chocolate fudge and everyone loved it. So glad to hear it! Thanks Michelle! I would think this fudge would probably work best for that. You could add maple extract to it, just leave out the cranberries. I hope this is helpful!